View all HTTP/HTTPS traffic during development. Is there a better alternative to Webber? 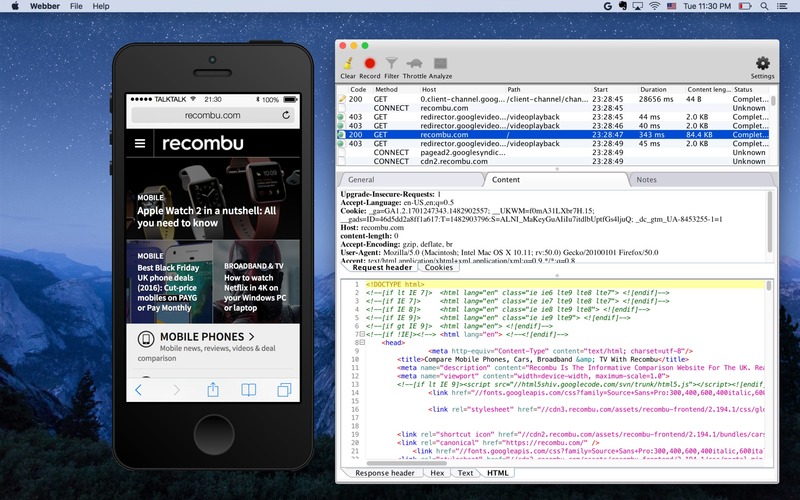 Is Webber really the best app in Developer Tools category? Will Webber work good on macOS 10.13.4? Webber is a web-debugging proxy that allows developers to view all HTTP/HTTPS traffic. View HTTP and HTTPS traffic - View all of the HTTP and HTTPS traffic between client and internet, including iOS, iOS simulator, Android, Mac, Windows, and Linux machines. After launch, you can easily start/stop recording. You can also filter unrelated traffic to refine the content. Webber needs a review. Be the first to review this app and get the discussion started! Webber needs a rating. Be the first to rate this app and get the discussion started! View requests, responses, and headers - Choose from a variety of viewers to inspect the requests, responses, and headers. You can switch viewers on-the-fly to find the right one. Syntax highlight viewer is also available. Simulate traffic and analyze behavior - Real network traffic's environment can be simulated by applying latency and bandwidth limit. Performance and behavior can be analyzed by dumping HAR file. Syntax highlight - Show highlighted syntax for HTML, JSON, XML, CSS, etc.